The Rockboard Scooter is actually two scooters in one. The advanced Rockboard technology allows you to shred the pavement in rockboarding mode or quickly transform it into a low-profile kick scooter. The rear spring-enhanced suspension means the smoothest ride even on the most unforgiving pavement. With superior strength and lightning quick dual-mode action adjustment, your new scooter means hours of insane fun. It features reinforced handlebar assembly for safety and an over sized nylon coupler that allows handlebars to be folded for compact storage. The telescope downpipe with height adjustment lock on the scooter lets you adjust the handles to your exact height, and the comfort grip and aluminum alloy brake handle allow for hours of Rockboarding with perfect control on the pavement. The two-position locking joint for dual-mode scooter capability and easy folding lets you take it anywhere, and racing-inspired bearings keep your scooter rolling. •Maximum Weight Capacity: 200.0 Lb. •Dimensions: Height: 8.25 "; Length: 39.0 "; Width: 15.0 "
Ready for some Rockin' FUN this Summer? 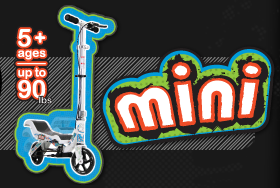 The Original Rockboard Scooter (Also Available in the Mini for ages 5+) will keep the kid's and parents alike, entertained and moving all Summer long! 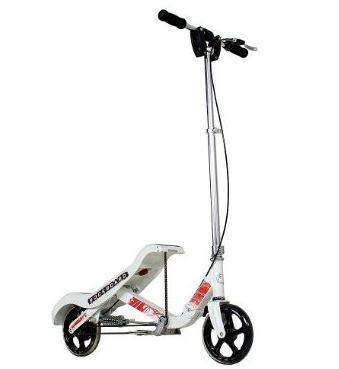 Unlike the traditional scooter, the Rockboard is propelled simply by rocking back and forth on the platform (see above video clips).With an extremely quick setup, and a frame that folds down to easily fit in the included carry bag (making storage a breeze), you can take it along with you virtually anywhere (vacation, friends houses, a trip to the park). To turn the Rockboard into a standard kick scooter, the platform easily slides back into place - essentially make this 2 scooters in 1! The Rockboard is a definite SUMER MUST-HAVE! Fun for the entire family! You can find more information about the Rockboard Scooter at http://www.rockboard.com/ . You can purchase the Rockboard Scooter at select retailer's, at http://www.target.com/ (where this item is currently eligable for FREE Shipping) and at Toys R' Us.